Sampdoria inflicted a tough defeat on Juventus when beating the six-times reigning champions 3-2 at Luigi Ferrari’s on Sunday. Sampdoria’s performance was truly stunning and means they’ve now beaten both Juventus and Milan at home to maintain their record of victory in every home game so far this season. Their 100% record is courtesy of the brilliant coaching of their head coach Marco Giampaolo whose philosophy has been so well implemented that even Max Allegri and Juve failed to deal with the Blucerchiati. This is how the game played out. Samp set out in their normal 4-3-1-2 formation while Juve came to Genoa in their regular 4-2-3-1. Allegri chose Federico Bernardeschi over Paulo Dybala in the number 10 position in the big selection surprise prior to kick off while Giampaolo continued with the duo of Duvan Zapata and Fabio Quagliarella understudied by Gaston Ramirez in the number 10 role. Giampaolo’s side usually defend in a strictly positionally-oriented manner where the main focus is for each player to keep their position according to the team’s defensive structure. The team then moves in unison across the pitch depending on the position of the ball. There was a slight change though as Ramirez had an individual role within the positional setup to stay close to Miralem Pjanic at times, especially when Juve tried to build from the back. The nature of the 4-3-1-2 formation means Samp had a very strong central presence and the idea was clearly to limit Juve’s possibilities of playing through the centre and instead forcing the Bianconeri to play down either wing. The influence of Pjanic was limited and Sami Khedira only managed 39 passes from central midfield throughout the game. 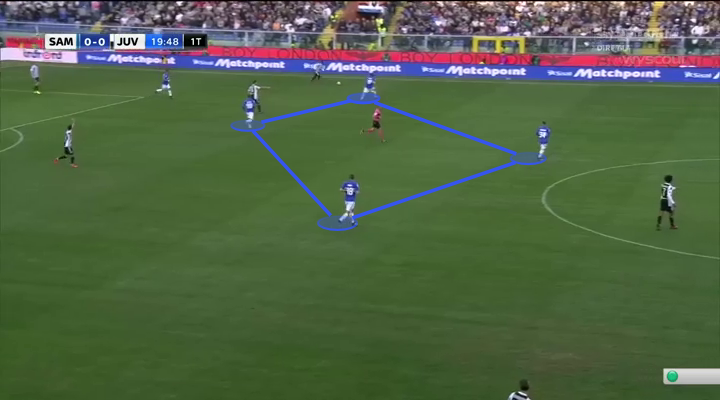 In the image above we can see the narrow midfield shape of Samp and the vertical compactness of their defensive shape. Cuadrado and Mandzukic have both moved inside which means Juve have no wide options which causes Cuadrado to play the ball straight too Torreira and Samp have succeeded in their defensive approach. Below is an example of how Samp steered Juve wide with their pressing. Chiellini as the left-sided centre-back was pressured by Quagliarella and forced wide to Asamoah. As the Ghanaian has now received the ball, he has no central option because of the positioning of Barreto and Ramirez, Quagliarella blocks the option to go back to Chiellini and Asamoah’s only option is a long ball forward. Sampdoria’s midfield were hugely successful in their defensive overloads after successfully forcing the play wide. In the image below Praet, Ramirez and Torreira has moved across while also Zapata and Strinic has made the options for Lichtsteiner disappear. When the ball travelled wide, Samp could use their full-back and ball-near central midfielder to double up on Mandzukic (below) or Cuadrado on the opposite side. Given neither are mercurial dribblers they mostly turned around and Samp were rarely threatened. This type of positionally-oriented defending schemes is to me the most proactive way to defend as you force the opponent to change the way they play because of your defending. Sampdoria pressed Juve high and forced them wide where they quickly overloaded and doubled up to remain compact and solid. Their defending forced Juve to change the way they attacked rather than changing the way they defend because of Juve attacked. Man-oriented defending has been a scheme many sides have used against Juve but the difference is a man-oriented approach is always reacting to the opposition, Giampaolo’s positionally-oriented approach makes teams react to Samp. The compact defending of Samp stifled Juve and restricted them in regards to their normal approach, but they are Serie A top scorers for a reason and they still managed to find some really good chances. As I’ve mentioned, Juve’s central attacking play suffered and they didn’t really threaten from the flanks either because of Sampdoria’s strong collective defending. They did find some luck by progressing through the right half-space mainly through the intelligent movement of Bernardeschi. The Italian attacker joined from Fiorentina in the summer and was a surprise inclusion in the starting eleven ahead of Dybala but he showed why he was selected with an encouraging display. Bernardeschi’s appreciation of space is one of his main attributes and stems from his time at Fiorentina in Paulo Sousa’s positional play where he often played as one of two attacking midfielders behind the striker. Bernardeschi quickly identified space behind Dennis Praet when the Belgian would press the right-back Lichtsteiner. Bernardeschi started high, almost in line with Sampdoria’s back four, but dropped into the empty space vacated by the Belgian before Torreira had managed to get across and cover his teammate. The image below is one example as Bernardeschi’s movement helps Juve progress the attack by playing through Samp’s pressure. These gaps didn’t appear often, but when they did Bernardeschi was quick to exploit them. He created Juve’s best chance in the first half when he played Higuain through on goal after receiving the ball behind Praet in the right half-space and then intelligently delaying his pass until Higuain was onside. Unfortunately for Juve and Bernardeschi, the Argentine’s strike was tipped wide by Viviano. The image highlights Bernardeschi after he’s received the ball behind Sampdoria’s midfield diamond prior to playing Higuain through. Given the way Sampdoria quickly overloaded the wing areas when the ball went wide, switches of play to the opposite wing would create problems for Samp as the ball-far full-back of the home side would be isolated against the winger. There were no occasion when this happened though, but one occasion saw Higuain receive between the lines and target the wide area when Samp weren’t organized. Higuain played a diagonal pass between Ferrari and Strinic but the Colombian fired wide. The sequence is highlighted below. Juve did create a few chances but overall, Samp restricted them to few opportunities. The 4-3-1-2 of Giampaolo opens up the possibility for many central combinations between the midfield diamond and the two strikers. Giampaolo deploys a positional strategy with Torreira as the orchestrator at the base of the diamond. The Uruguayan runs the quick, short passing combinations which Giampaolo encourages. Samp consistently uses the concept of the 3rd man to find the free man with their short passing to exercise positional superiority against their opponents. Given Juve only had two central midfielders, Samp had both numerical superiority with 4 vs 2 but also a positional superiority against Juve’s midfield due to the positioning of Torreira between Juve’s attack and midfield as well as Ramirez between Juve’s midfield and defence. Barreto and Praet (later replaced by Linetty) mainly played deeper alongside Torreira to attract pressure from Pjanic or Khedira which could then see a quick lay-off pass before a penetrating pass into Ramirez or either of the strikers. Sampdoria’s attacking shape looks as below, with the two full-backs highlighted in wide areas, the two strikers high against Juve’s centre-backs and the midfield diamond with its connections. The deployment of the four midfielders so close to each other is the key to create the short passing combinations Giampaolo wants. Samp move the ball quickly and makes it difficult for opponents to get close to them. Sunday was no different and Juve could spend minutes without touching the ball, even after going one and two goals down in the second half. The image below highlights the options Torreira has when facing forward. He can find so many of his teammates thanks to their close proximity to him as the ball carrier and his passing range enables him to reach either wing with sweeping passes as well as his quicker and shorter central options. 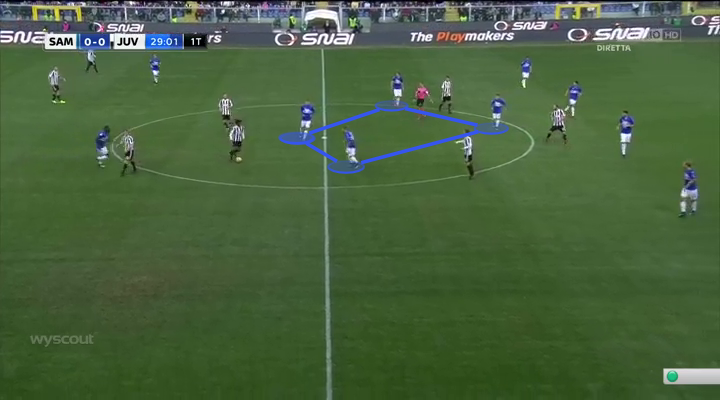 Juve struggled to deal with this aspect of Sampdoria’s positional play in attack as they created a number of good opportunities on top of their three goals. The inclusion of Zapata up front and his quality as a target man also gave Samp another method of progressing attacks as he dominated the Juventus defence with his aerial ability and strength. He scored the first from a cross and acted as the reference point for the attack leading to the second. Samp’s attacking play was therefore also multi-faceted. Juventus came to Genoa and were soundly beaten by a terrific home side despite the visitors late rally to net twice in stoppage time. That didn’t matter in the end as Sampdoria had already scored three and ultimately won 3-2. Juventus found some solutions in their attack which is testament to their quality and Allegri’s intelligence, but on the day Marco Giampaolo’s excellent Sampdoria were too good for the champions and continue to defy expectations in Serie A. They’ve won every single one of their home matches this season and Sunday’s win was courtesy of compact, positionally-oriented defending, a positional play model based around short passing combinations and the use of Duvan Zapata’s target qualities. If you have the chance to rewatch the match, do it. It was a great contest between two of Europe’s best coaches.